The game was scheduled for a 12:30 p.m. (CT) kickoff. But CBS elected to televise it, so kickoff was moved to 2:45 p.m., 3:45 p.m. at University Park, Pennsylvania. As a result, Beaver Stadium had to be equipped with lights for the first time in its 95-year history, just in case. Gary Bender and Pat Haden were the CBS announcers. ABC-TV offered Stanford at Ohio State, with an 11 a.m. kickoff. As noted in last week’s Tom’s Time, Nebraska had moved ahead of Pittsburgh to No. 2 in the Associated Press rankings, behind 2-0 Washington. Penn State was No. 8 – or No. 5 in the United Press International coaches’ poll, if you prefer. The Huskers were No. 2 in those rankings as well. The Beaver Stadium crowd, which included an estimated 4,000 Nebraskans, was a record 85,304, the most ever to watch the Huskers in a regular-season game. The ’41 Rose Bowl game against Stanford drew over 90,000. In retrospect, the game was pretty much all that needs to be said about Nebraska’s 1982 season. And YouTube provides visual evidence of why Husker fans came away frustrated. Had there been replay in 1982, Nebraska might well have won and gone on to play for a national title, given its ranking and the way it finished the regular season. Here’s a synopsis of what you would see . . .
With 8:18 remaining and the Huskers trailing 21-17, Nebraska cornerback Neil Harris intercepted a Todd Blackledge pass in the end zone. Turner Gill then directed a 13-play, 80-yard touchdown drive – he ran the last yard with 1:18 remaining. Kevin Seibel kicked the extra point. Seibel’s kickoff went into the end zone, but Nebraska drew a personal-foul penalty, moving the ball out to the 35-yard line. Ten plays later, eight of them Blackledge passes, five of which were complete, Penn State took a 27-24 lead, with only 4 seconds remaining. Husker fans will tell you just three of the passes were complete. There were questions about the final two, the first a 15-yarder to tight end Mike McCloskey at the Nebraska 2-yard line. It appeared McCloskey was out of bounds when he gained possession. 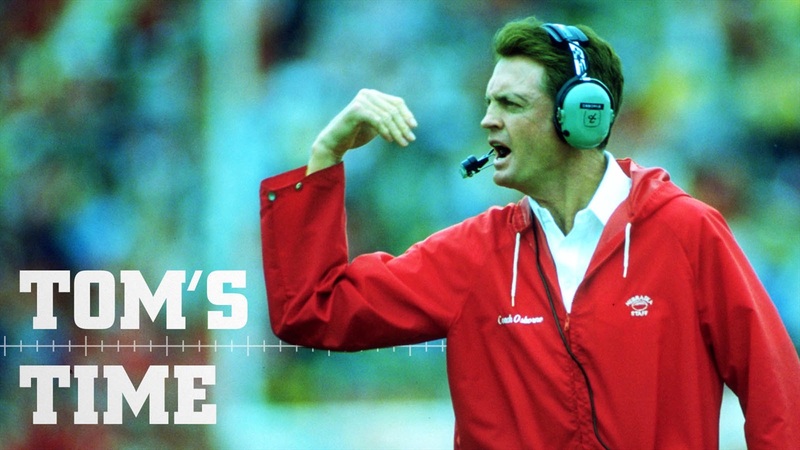 Tom Osborne was tactful in his response to the pass. “I don’t know how they could’ve seen that play like that,” he said of the officials. On the next play, with time running out, Blackledge passed to tight end Kirk Bowman, who had caught a touchdown pass to open the scoring late in the first quarter, in the end zone. They were the only pass receptions of Bowman’s career at that point. Bowman grabbed the ball just before it hit the ground – or after it did. “I was just concerned the officials would think I did, so I got up fast and showed them the ball. I caught it about 6 inches off the ground, but I did have it,” Bowman was quoted afterward. The controversial finish didn’t necessarily summarize the game, however. Penn State amassed 505 yards of offense, underscoring what Osborne had said prior to the season about the relationship between championships and great, rather than just good, defenses. By that standard, Nebraska had plenty of time to come back. After an off-week, Penn State, ranked No. 3, lost to No. 4 Alabama in Birmingham 42-21. The Crimson Tide climbed to No. 2, then lost four of its next six to drop out of the rankings. Yet in mid-November, the Nittany Lions moved ahead of Nebraska in the polls and were No. 2 at the end of the regular season. Osborne had hoped for a rematch with Penn State, an independent, in the Orange Bowl. But the Nittany Lions opted to play No. 1 Georgia in the Sugar Bowl, logically so. Even if Nebraska had been ranked ahead of Penn State, the Huskers couldn’t have played Georgia because of conference-champion tie-ins to bowl games. Penn State beat Georgia 27-23 to earn Coach Joe Paterno his first of two national championships. Whether his not having won a national title to that point influenced how some voted in the polls during the season was a matter of reasonable conjecture.